2 February 2016, at 12:00a.m. 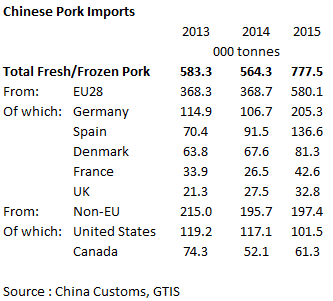 CHINA - Chinese pork imports rose 38% in 2015, compared with 2014, totalling 778,000 tonnes. 2015 was an exceptional year for pork imports to China, exacerbated by the significant rationalisation of the Chinese herd in the first half of the year. This was brought about through high feed prices and low pig prices at the beginning of the year, reducing producers’ profitability. Following the decrease in herd size, the wholesale pig price increased, which could be capitalised on by importing countries. Exports from EU Member States increased substantially over the year, up by 57 per cent compared to 2014, with 580,000 tonnes of pig meat exported, almost three-quarters of the total. This was largely driven by Germany, which almost doubled its level of exports year on year. EU pork was particularly attractive to the Chinese market as the euro had weakened against the dollar, making it more price competitive and there was a supply glut following the cessation of trade with Russia. Imports from non-EU countries stayed largely stable. The United States, historically the main exporter of pork to China, saw a reduction in volume of exports by 13 per cent in 2015 compared with the previous year. US supplies were affected by labour disputes in some West Coast ports in the early part of the year. Also, as previously mentioned, the US dollar was stronger than the euro, making US product less attractive to the Chinese market. Coupled with this, China does not allow the growth hormone ractopamine into its food supply and this is routinely used by a large proportion of US producers. The Chinese pig herd is forecast to increase by the second half of 2016 as producers are attracted to the market by the high wholesale pig price. Coupled with the slowdown in Chinese economic growth, this could mean imports in 2016 as a whole may not reach the same level experienced in 2015.